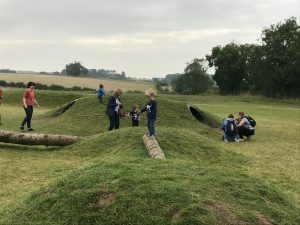 With family living close by we love a day out at Willams Den! We do the journey across to East Yorkshire regularly and Williams Den is easy to find just off the M62 at North Cave, it takes just under an hour from North Leeds. The first thing that strikes you when you drive into Williams Den is the Yorkshire Wolds scenery and open space all around. 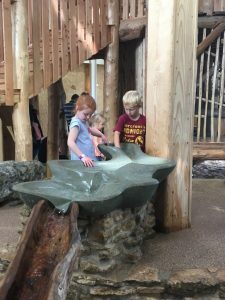 The owners were brought up in this area and through Williams Den wanted to make the great outdoors and nature accessible to all. 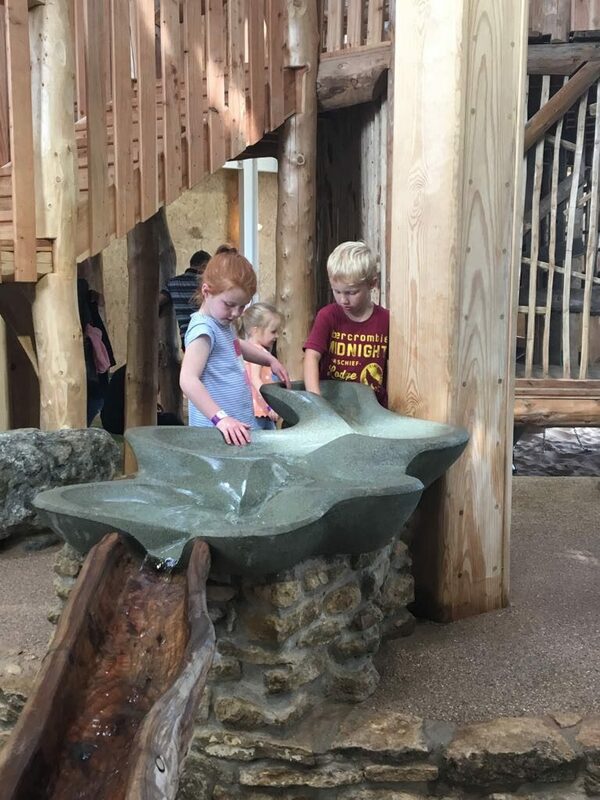 In Williams Den they have certainly created something different to the norm when it comes to family attractions. At the heart it’s all about adventure, embracing play, with dens and plenty of sensory experiences to use your imagination. 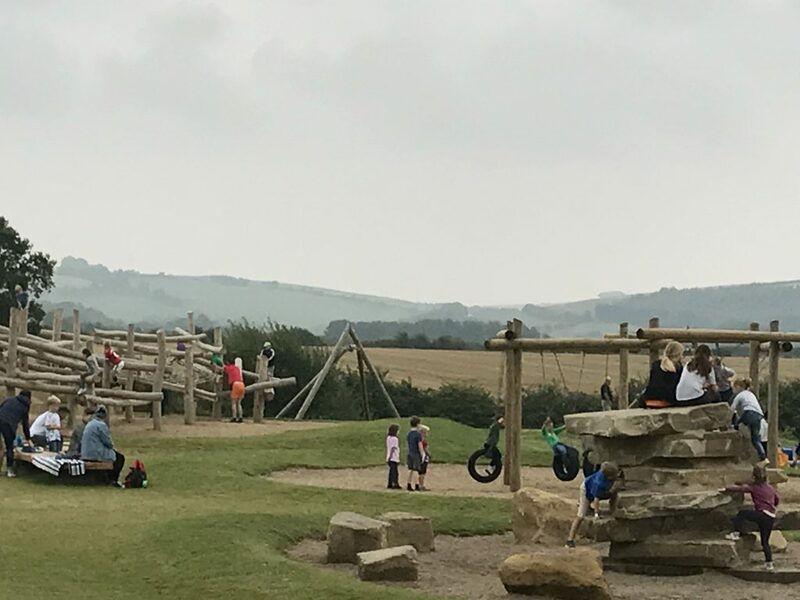 We set off from North Leeds in drizzle so we packed the wellies and waterproofs as we had heard there was plenty to do outdoors in the ‘den’. 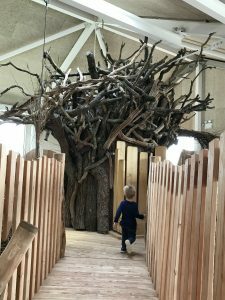 On entry we were met at reception by very welcoming staff who really engaged with the children about what the den had to offer. We all had to put on wristbands and my phone number was put on the children’s and the staff explained that all staff had blue t-shirts on in case they got separated from me. This really put me at ease as I did let my 6 year old go off and explore when inside the den. The children with us were 6, 5, 3.5 years and 2.5 years. The den is accessible to all and unlike some climbing structures where the younger children struggle to climb up parts (and get cross as they want to do what the older siblings are doing) they could access it all. 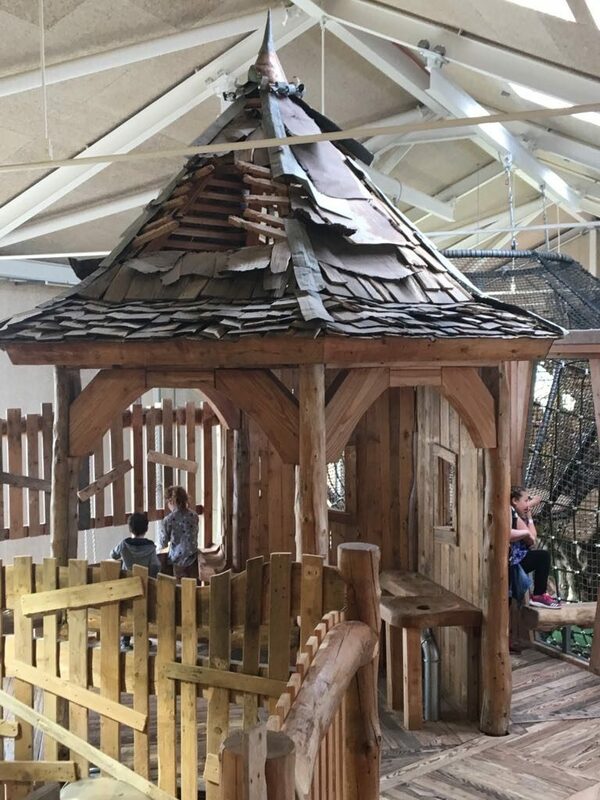 The den is very ‘adult friendly’, adults are encouraged to embrace the play with their children. 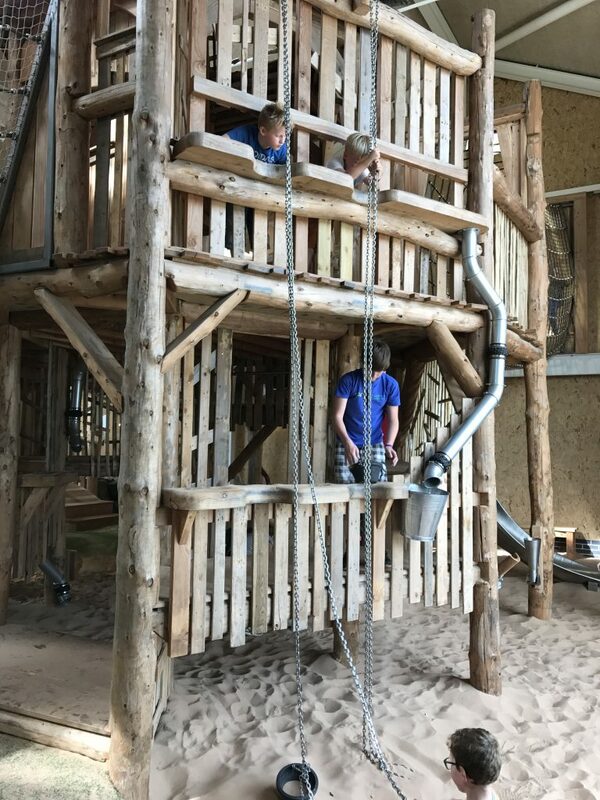 We had a great game of ‘hide and seek’ in the den which I think I enjoyed as much as the kids! 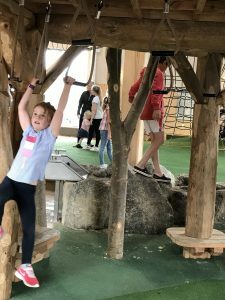 My children were in their element in the den – the eldest thinks she’s a monkey and spent a lot of time swinging through the trees and hanging from things, whilst the youngest loves water so spent most of the time climbing over the rocks and pumping water through the many channels ! 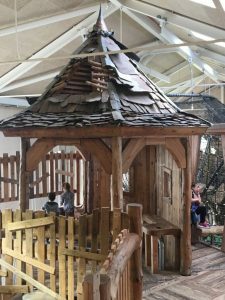 The den is a huge Treehouse connected by nets, beams and bridges, fireman poles, a slide, rope swing and some fabulous musical chairs. 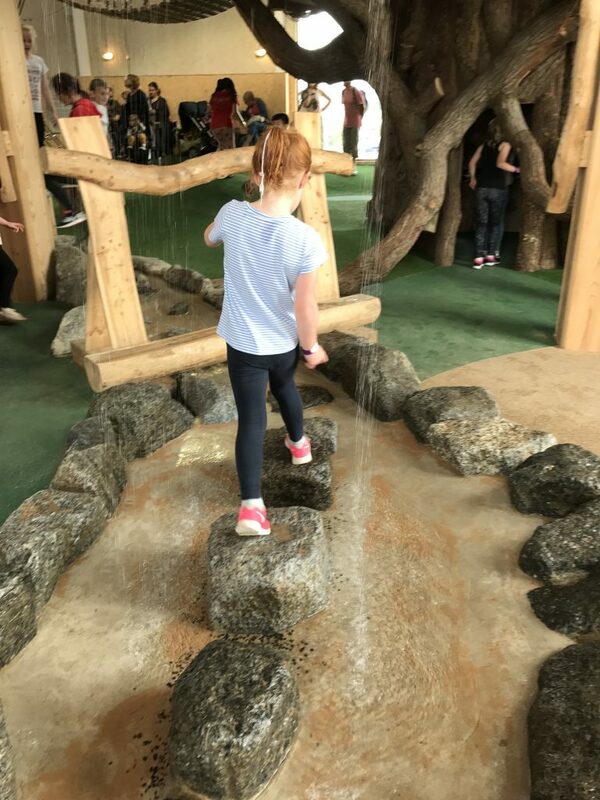 There is also a little ‘river’ water play area (we ended up with wet trainers before we went outside!) and a large sandpit area too. 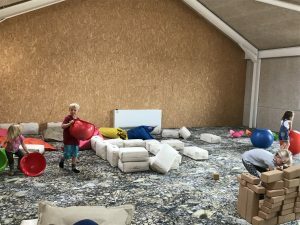 There was also a large room with soft materials to build dens which was very popular with the younger ones. My friend and I based ourselves here, got a cup of tea from the snack hut and the older children went off and played in the main structure. 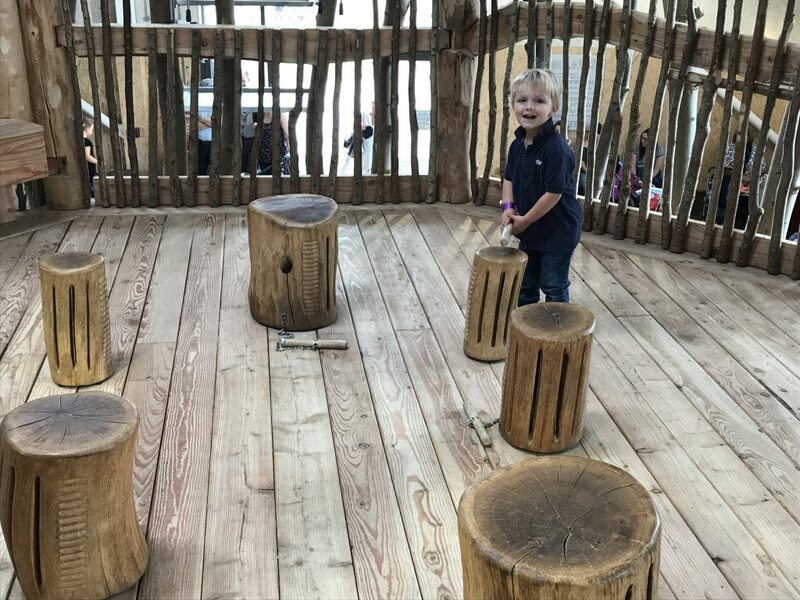 The nature of the den also encourages children to work together and be kind to one another rather than at traditional soft plays which can often become a ‘free for all’. 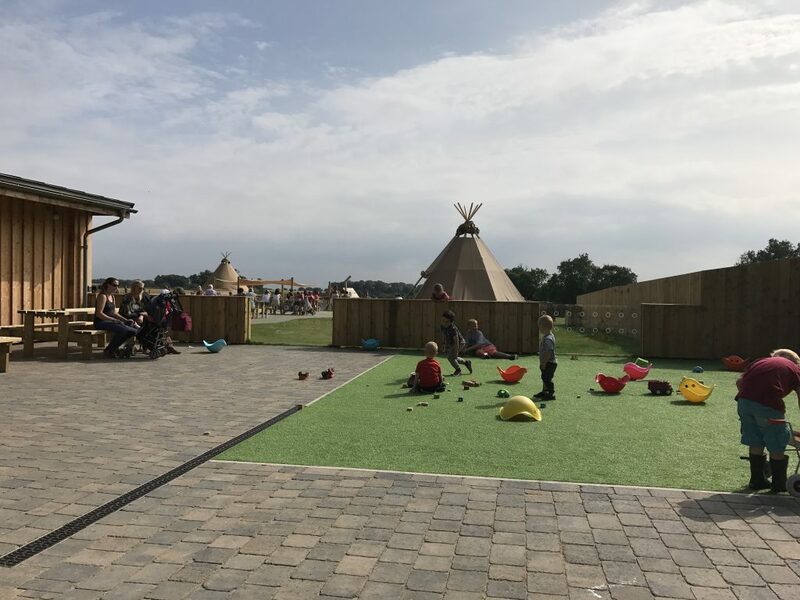 There were staff manning the den at all levels and did pick children up if the behaviour was not in the ethos of the den which I was very impressed with. They are also constantly sweeping up the sand or cleaning out the water pipes, it was immaculate! There is plenty of space outside for picnics and some great hand crafted picnic benches which I loved! After lots of picnics in the week already we decided to have lunch in ‘The Kitchen Table’ and we were hugely impressed by the quality of the food. The kids pizzas were wood fired and delicious, two small pizzas fed the three of us . 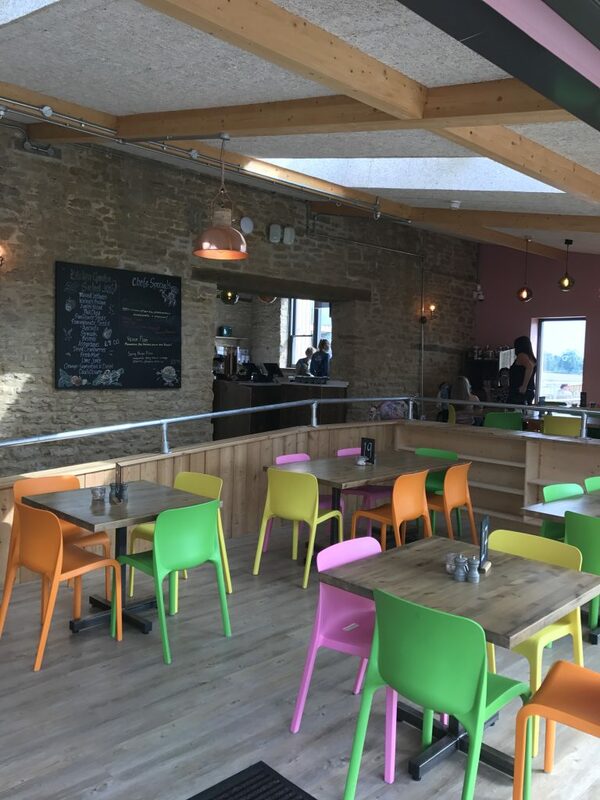 We got a table outside (your order is taken at your table) within a little enclosed area with pub benches (big and small) and a grassed style area. 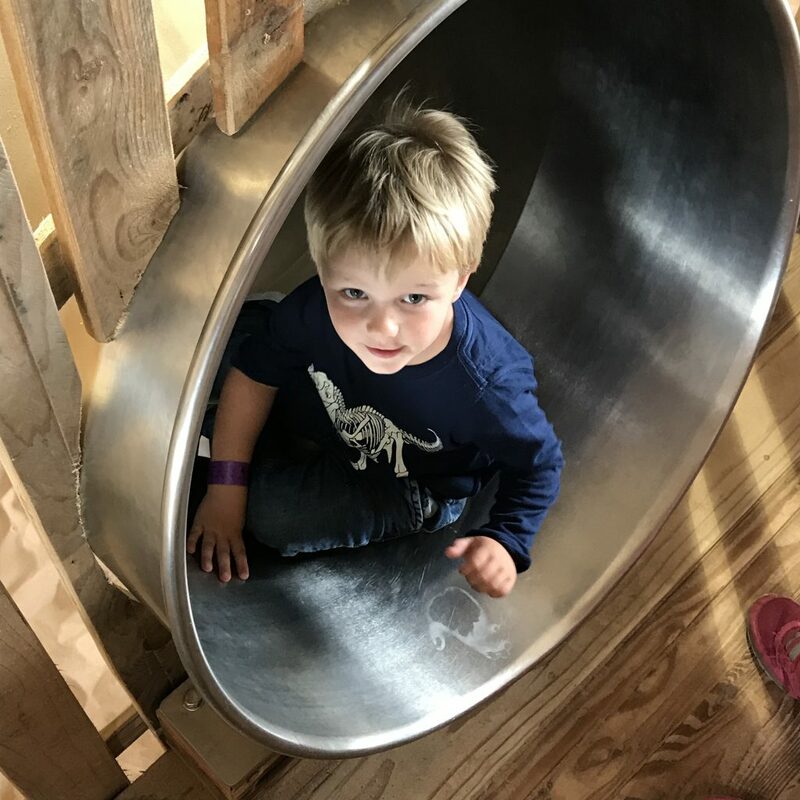 You can enter the Kitchen Table and this play area without entering the den so there is no charge if you just want to come here with little ones and have a coffee or bite to eat with friends. 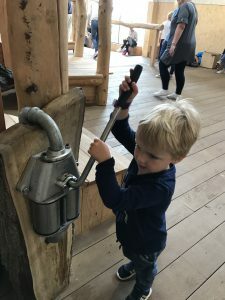 There is a range of toys and a chalk board for kids to play with including some stacking bricks and cool spinny seat things – fantastic for little ones and it amused ours whilst the food came. They also had a fantastic selection of ice-creams sundaes and cakes! 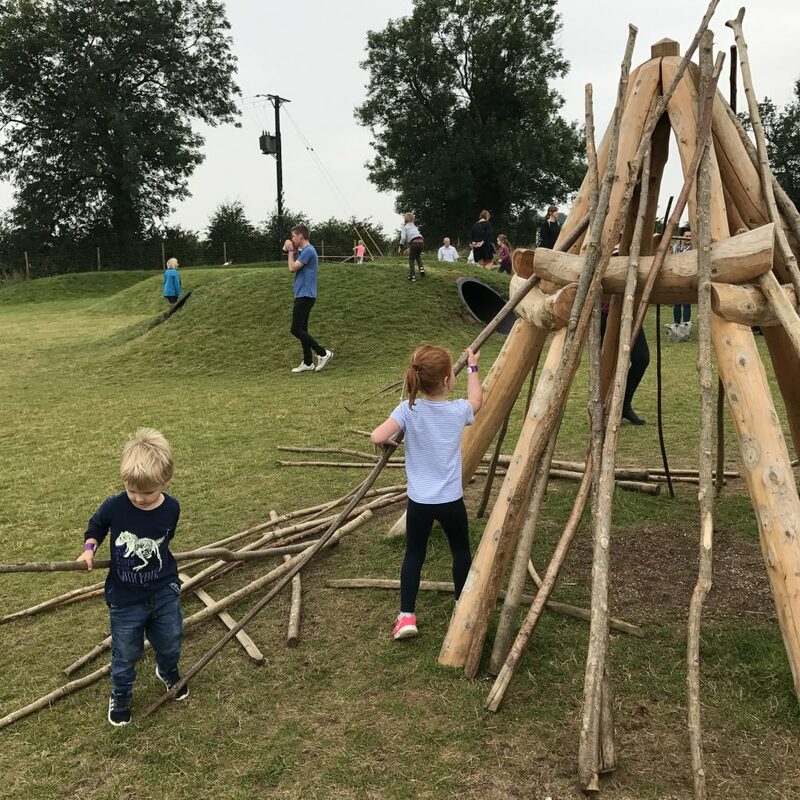 After persuading the kids that they didn’t need to go back inside the den we convinced them to go outside and once outside the older children didn’t know where to go first !! 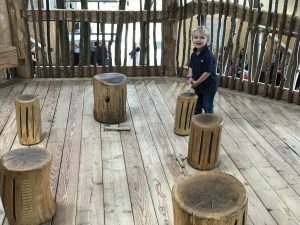 The whole play structure is built from very good quality, natural materials. There are loads of mounds (mountains and molehills) that have been created to give the ‘rolling hills’ feel which makes brilliant simple play for the kids to run up and roll down plus they’ve put some cool tunnels through some so the adventure continues. My youngest was really pleased with himself that he balanced on the ‘tree trunks’ between the tunnels. 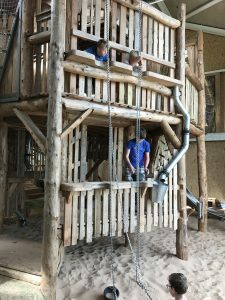 My 6 year old loved the huge climbing frame made from tree branches and the tyre swings, both children loved the zip wires and I enjoyed pulling them back for what felt like the 100th time! You are able to build proper dens with massive sticks and the basic structures in place. We spent quite a while here, I just had to over see the youngest with the sticks!!! 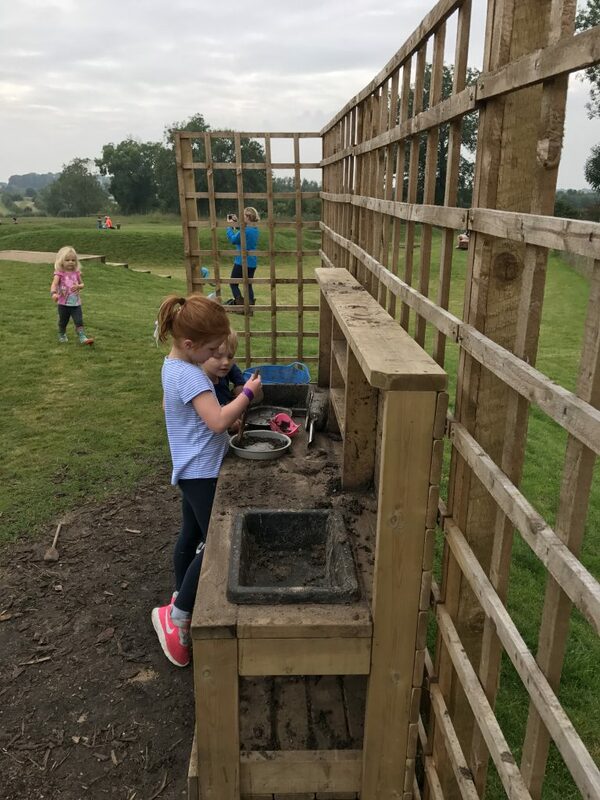 There is also a sand play area with climbing frames, more water play and slides which is ideal for pre school and younger children. 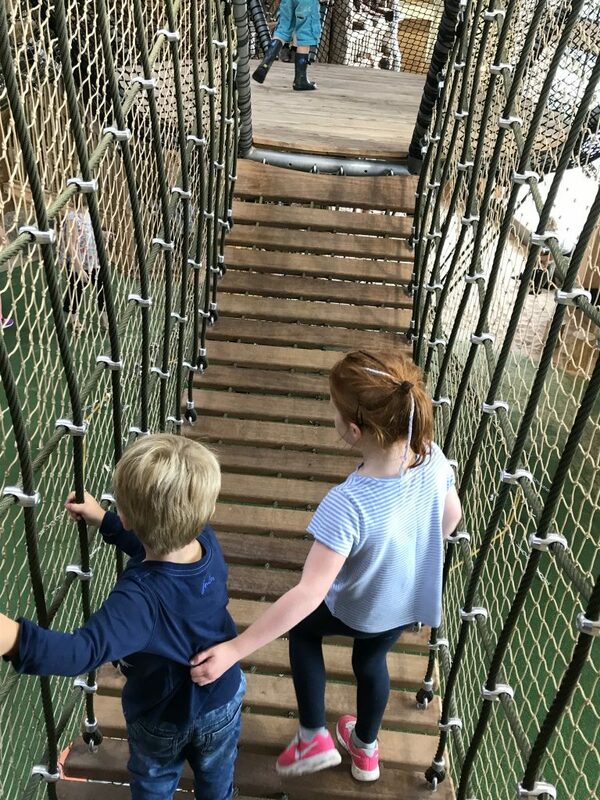 If you are looking for something totally different to experience before the end of the holidays we would highly recommend Williams Den. If you have younger children we would recommend going with other adults or friends so the older children can do similar things and the younger children can be in a different part. 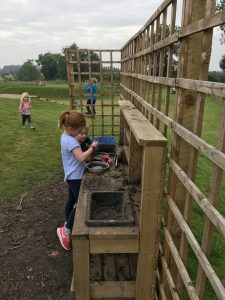 Take change of clothes and wellies – the nature of Williams Den is that children get stuck in so they will get wet, sandy, muddy (mud kitchen) so I would take waterproofs or a change of clothes. Mine don’t like climbing in their wellies so trainers did get wet but it didn’t bother them. Take a Picnic – The food is fab but there are also loads of places for a lovely picnic and gives you a base when exploring the outdoor adventure. Toilet trips are easy! The loos are very family friendly! 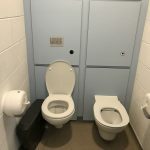 They have double loos so both kids can “wee at the same time”. 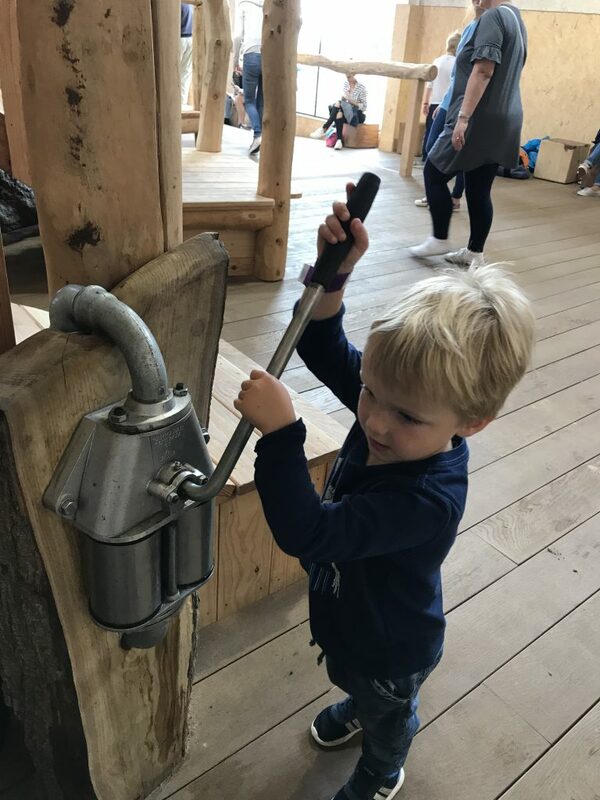 Take snacks and drinks– with this much play, the kids need regular energy top ups and it’s fine to eat your own food in the outside areas. Head to the Hideout – When you need a bit of chill out time (the younger children did need this as there is lots of running around and climbing) head up to the Hideout – it is a more open inside area and has sand bags and play bricks to build more dens, also big cushions to relax on. Saturday Socials on 11th August & 1st September: The Den will be open from 9:30am – 9pm!